The Craftsman 342 cc 30″ dual stage Snow blower is a feature rich snow machine that makes clearing any driveway a breeze. The combination of a powerful engine, an automatic transmission and easy controls makes this machine one of the more popular snow blowers. This is a dual stage machine with both an auger to cut the snow and an impeller to blow the snow in the direction you desire. The impeller is 12 inches and the augers are the saw tooth variety and also 12 inches in diameter. This snow blower comes equipped with an automatic drive which allows you to vary the speed without stopping. It also has finger controls that allow you to steer with the touch of a finger and to operate with one hand, while using the other to adjust the chute to blow snow in the direction that you desire. The tires are 16 inch by 6.5 inches. 342cc Briggs & Stratton, Snow Series Platinum engine, 16.5 ft lbs torque. MRS spark plug for a surefire spark every time. Engine: 342cc Briggs & Stratton, Snow Series Platinum engine, 16.5 ft lbs torque. MRS spark plug for a surefire spark every time. Transmission: Automatic drive designed for quick removal of large amounts of snow. Yard lights for early morning & nighttime. Heated handle grips help keep your hands warm in cold weather. Steel remote chute. Remote chute deflection control allows operator to adjust the angle of the chute deflector without having to stop the unit. Power steering allows for easy maneuverability to handle obstacles. Single hand control allows you to control unit from either side by using one handle, enabling you to operate the chute with one single action & without having to stop. This particular Craftsman snow blower comes equipped with yard lights to assist in illuminating the area you are clearing. In addition there is an electric starter that can be used to help start the engine instead of having to use the pull chord. The drift cutters are also useful in situations were there is deep snow caused by drifts across your driveway. They help to cut the snow and caused the higher snow drifts to tumble down in front of the auger. In addition to being able to guide the snow thrower with one hand the operator can manage the chute and the snow deflector to change directions while operating the snow blower. This flexibility makes it easy to do a quick job of any area that needs to be clear were you want to avoid a lot of obstacles. The 342 cc dual stage snow blower can be picked up or it can be delivered to your home for an additional price. Consumers with access to a van or small trailer can save themselves the delivery fee by making arrangements for pickup. 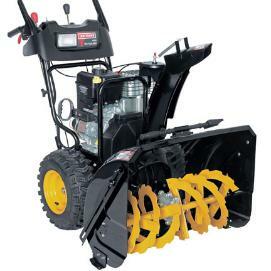 Although not mentioned, most snow blowers can accommodate chains for the tires to provide better traction on icy conditions and also snow and wind guards to protect the operator from blowing snow during windy days. Online Reviews: We were unable to find any online reviews for the Craftsman 342 cc 30″ dual stage Snow blower, however please leave your comments at the end of this blog if you have used one of these machines. This craftsman snow blower is a powerful machine and should be treated with safety in mind. Carefully read all of the safety guidelines in the manual prior to operating the machine for the first time and follow these guidelines to ensure that both you and the machine do not have an accident. Prior to starting the Craftsman 342 cc 30″ dual stage Snow blower the first time each day, perform a quick walk around check of the machine to ensure there are no loose parts and no leaking fluids. Check the engine oil to ensure that it is at the correct level as specified by the manual. Top up if necessary. Fill the fuel tank while the engine is cold and prior to using the machine. If you do spill fuel, wait until it has fully evaporated prior to starting the engine. Never spill fuel on a hot engine to avoid fires and always fill the fuel tank outdoors to avoid any possibility of vapors going into your house. Maintenance is important for your machine to operate at peak level for many years. Change the engine oil regularly. Check the belts for tightness. Change the spark plug as required and grease any spots outlined in the manual. If you need to leave the snow blower outside all year round, cover the machine. Use a proper cover to keep it looking new. This will help avoid deterioration of the tires and metal components. For more posts about Craftsman snow blowers, click here. Where can I find a tech for this machine in Edmonton as I have a problem with mine? to be exact, the engine works but the propulsion doesn’t, and the machine doesn’t move forward. Check that the belt drive is still in place. There is also a friction clutch. Make sure that it is also engaging. The propulsion system uses a smaller circular wheel that has a rubber impregnated outer perimeter that meets another pulley at 90 degrees. The linkage when engaged to go forward pushes these two pulleys together. The linkage may require adjustment so that more force of friction is applied. The wheels slip at least bit of moisture. This type of setup does not work well but you can get it to work. Hydrostatic drives with tracks but you pay for that. 30inch and 16.5 #ft torque model 944-520690 342cc purchased in Canada. Thank you.